There are game developers in Ankara, Turkey? Cape Town, South Africa? Costa Rica?! Videogames grace every continent; we know this. Different platforms, genres and tastes may dominate a given country or region, but games in general are pretty much everywhere. Yet, with the ubiquity of game playing, it's odd that so many of us see game development in a different context. With high barriers to entry, most people assume commercial game development primarily takes place in geographic hubs like California or Japan, with only a few outliers to back them up. But it's not really that way anymore. Just as games are everywhere, so too are game-makers. The recent Global Game Jam played an important role in busting apart the prevailing notions of who makes games and where they make them. Organized by the International Game Developers Association's (IGDA) Education Special Interest Group (EdSIG), over 1,600 participants spread across 54 locations in 23 countries (including Ankara, Cape Town and Costa Rica), took up the challenge of creating a game within 48 hours. The jam-ness of the endeavor was striking enough, with 360 unique playable games produced before the timer hit zero. But it was the global nature of the event that truly impressed. It proved that talented teams and individuals all over the world are creating games - and gave them a way for their work to reach a global audience. Urban economist Richard Florida has been studying the effect of location on our lives, especially in relation to creative industries. His latest book, Who's Your City? : How the Creative Economy Is Making Where to Live the Most Important Decision of Your Life, posits that choosing a home city is one of the most critical decisions a person can make. There's obviously a lot of data and research that go into his theories and rankings, not least of which includes factors relevant to creative industries - idiosyncratic criteria like number of art galleries, used book shops and organic produce stands; or prevalence of a bohemian lifestyle, a certain political persuasion and so on. Can the same be said for games? Or more specifically, for game development? 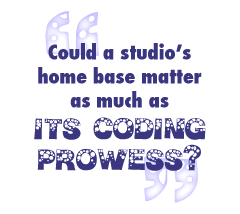 Could a studio's home base matter as much as its coding prowess? Did Rockstar's Scottish headquarters affect the creation of the Grand Theft Auto series - a franchise that, by the way, most gamers assume was made in America? And why are so many MMOG developers based in Austin? Why so many sports games from Vancouver? Platformers from Japan? Casual games from New York? Narratively ponderous adventures from France? Technical showcases from the U.K.? Bleakly nihilist shooters from Ukraine? Some degree of regional specialization may be a natural response to the cost-of-entry problem noted above. But there's a contradicting truism: Today, games can be made anywhere. Some computers, a net connection and pizza are all that's needed to transmute talent into game development greatness. Yet despite that freedom, we don't see this on the scale you'd assume.